The kidney is a masterpiece of beauty and function. Often I have held a human kidney in my hands, admiring its rich color, the intricacies of its design, the symmetry of is graceful curves. To view this small creation and realize the massive job it performs throughout a lifetime, I am awestruck at the mind of the One who designed it. The form of the kidneys is truly artistic, yet it is one of our most hard working organs. It is also a marvel of engineering perfection. Each day our kidneys filter 50 gallons of water, most effectively so that it can safely be returned to the system. Without this extremely effective filtering and recycling system, we would have to drink 40,000 glasses of water a day and practically live in the bathroom. The function of the kidneys is truly admirable. Our kidneys are victims of the modem way of life. Most people are chronically dehydrated which puts a great stress on the kidneys, calling upon them to process ever more polluted blood, filtering out large amounts of impurities and excess nutrients. In this water-starved environment we hope and expect our kidneys to pass these impurities and other excess baggage on down to the bladder. It is sort of like asking someone to paddle a canoe down a wet street. Pretty tough going! The fortitude of the kidney is truly amazing. But there comes a time in the experience of many a kidney that the constant assaults of a lifetime of poor eating and drinking habits catches up. Then, as men who have been there can attest, they have a bit more of an appreciation for what women go through in childbirth. The pain of a kidney stone is exquisite, but even worse, as these “labor pains” can last for months. 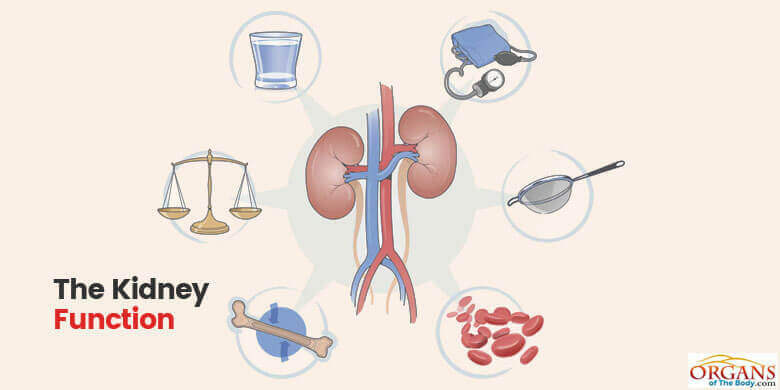 In this paper, we have attempted to explain a little bit about the kidney, how to care for it, and how to treat its most common ailments. Read and heed, for the failure of the kidneys is truly agonizing. Americans tend to eat much more protein than they need in the erroneous belief that if protein is good for you, much more must be better. But a large amount of protein not only is not good for the human system in general, it is potentially harmful to the kidneys. The high protein weight loss programs that are so popular among dieters are frankly far more harmful than the weight they wish to lose. Not only are the kidneys overworked, but several other health concerns are raised such as the effect on the bones and blood vessels, not to mention the increased risk of cancer. A person should drink enough water every day so that almost clear urine is passed four to five times during that day. And although most people do not need this counsel, drinking more than two gallons of water daily can also be injurious to the kidneys. Those who are in chronic dehydration vastly out number those who are approaching water toxicity. Diabetes and high blood pressure are the two major diseases harming the kidneys. Certain medications can also injure the kidneys, particularly the pharmaceutical diuretics, pain killers, and some antibiotics that are excreted by the kidneys. Stones may be formed anywhere in the kidneys, ureters, bladder, or urethra, or they may travel from one place to another throughout the urinary tract. The rapid onset, or even sudden onset, of severe sharp pain in the flank may be the first sign. Associated with this can be nausea, vomiting, blood in the urine, paleness and sweating. The pain is often of an exquisite nature, and those who have had both say that kidney pain is worse than the pain of heart attacks. Pain and blood in the urine are signs of kidney stones. There are other things that make red urine such as beets. If you notice what appears to be a reddish tint to your urine, first recall what deep red things you may have eaten over the past few meals. If you don't recall eating anything deep red then make an appointment to see your doctor. The pain of a kidney stone is due to either stretching the ureter or the kidney pelvis by backed up urine during blockage by the stone, or by actual movement of the stone down the ureter. As the saying goes, an ounce of prevention is worth a pound of cure. Following are some simple steps you can take to miss an expensive and painful appointment with a kidney stone. Some people are known to be stone formers, constantly passing small, sand-like stones. These people should find a laboratory that will give them an analysis of their stones. They should then pay attention to foods having high analyses of that particular substance of which their stones are made, such as phosphates, oxalates, calcium, etc. Once this discovery has been made, it remains only to avoid those foods, thereby hopefully avoiding the formation of a larger stone. There are various lifestyle factors known to increase a risk of certain types of stones. With the advances in medical technology you would think that kidney stones would be on their way off the most dreaded list of afflictions in America, but that is not the case. The fact of the matter is, stones are on the rise. After World War II dietary fats and oils, animal protein, and milk products greatly increased, and by 1970 kidney stone formation was about three times higher than it had been prior to 1940. It has been suggested that milk, animal protein, foods high in oxalates, high sodium, and a high sugar diet increase the likelihood of stone formation. Does that menu sound a lot like the typical American diet? It has also been suggested that fiber, magnesium, and potassium reduce the risk. A high potassium diet, as in fruits and vegetables, decreases urinary calcium excretion and tends to be high in alkali, thus increasing urinary citrate. This combination has been found to reduce stone formation by 51 percent. Foods that are high in oxalate have been suggested to increase stone formation. Rich sources of oxalates, which comprise the commonest type of kidney stones (70 percent), include chocolate, black tea, beets, figs, ground pepper, peanuts, oysters, parsley, rhubarb, spinach, and poppy seeds. Avoid dairy products, red meat, excessive salt intake, and whole sesame seeds. Always drink at least ten eight-ounce glasses of water per day if you have a high risk of kidney stones. For individuals who have a genetic or a dietary problem with the use of refined carbohydrates, eating foods high in oxalates will increase their risk significantly for getting kidney stones. The refined carbohydrates which increase stone formation include items such as sugar, white rice, and white flour products. Three heaping tablespoonfuls of unprocessed wheat, or rice bran, on the other hand, were found to reduce the risk of formation of renal calculi by half. A high fiber diet using grain brans and reducing the calcium intake, will go a long way in preventing kidney stones. Protein should also be low as it encourages excretion of excess calcium in the urine. Animal products include meat, fish, chicken, cheese, milk, and eggs. The consumption of animal protein in a population, to a large degree, determines the risk of kidney stones in that population group. Since animal products are also high in fats, it may be in part due to the reduction in fats that vegetarians have fewer stones than non-vegetarians. It is certain that a low fat diet will help prevent the formation of kidney stones. A high intake of salt increases calcium loss through the kidneys, which may be converted from the urine into kidney stones. Salt is high in almost all refined food products and canned goods. Another study found that kidney stones are caused, at least in part, by not getting enough exercise, and by drinking coffee, tea, colas, chocolate, or alcoholic drinks, and by failing to drink sufficient water during periods of hot weather to compensate for fluid loss. During dehydration there is a concentration of waste products, which encourages such minerals as calcium and oxalate to form crystals; then kidney stones can develop, one crystal at a time. The risk of forming kidney stones can be greatly reduced by cutting out soft drinks. The phosphoric acid in the drinks is sufficient to put a person at greater risk of forming stones. As phosphorous levels rise in the blood, calcium levels fall, meaning the kidneys are processing large amounts of stone-forming calcium. And once phosphorous levels themselves drop, the blood is replenished with calcium taken from the bones, thus causing osteoporosis. Men prone to developing kidney stones may help to prevent them by drinking orange juice, or eating ample quantities of oranges. About one pint per day is as effective as standard drugs for keeping kidney stones from forming. Citrate in the juice inhibits calcification of the stones. Eating oranges, lemons, limes, and grapefruit with meals seems to prevent kidney stones, as certain people prone to stones have low levels of citrate in their urine. Men are three times more likely than women to get stones, and ages 40 to 65 are the most favored ages. Citrus fruits, although they are acid in the stomach, leave an alkaline residue in the urine. Acid urine tends to precipitate uric acid stones. Celery in the diet keeps stones from forming. Three stalks of celery pureed and taken daily should be adequate. A cucumber every day is also helpful in prevention. The vegan vegetarian diet is the most favorable, with no between meals eating, no soft drinks, no fruit juices in greater quantities than four to five ounces at a meal and a diet low in free fats. We suggest generous quantities of pumpkin seeds in the diet as they have been found to inhibit crystal formation in the urine. Evidence has accumulated that a vegetarian diet with its type of protein is handled more efficiently by the kidneys than animal protein. Soybeans have a protein which is quite favorable for the prevention of kidney stones. "As in water face reflects face, so a man's heart reveals the man." "Even in laughter the heart my sorrow and the end of mirth may be grief." "A sound heart is life to the body, but envy is rottenness to the bones."